With George W Bush having been re-elected, despite Michael Moore’s books and movies, the anti-Bush lobby looked as if it was going to run out of ammunition. 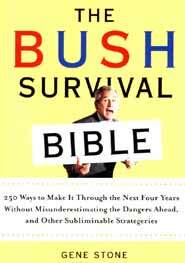 However, rather than wait until three years into the presidential term before reloading their WMD’s (weapons of mass derision) and reloading the shelves, they managed to produce (in very quick time) The Bush Survival Bible, edited by Gene Stone, ISBN 0-8129-7476-X, published by Random House at the end of 2004. The book is made up of short snappy chapters claiming to cover Tips to Maintain Your Sanity, People Worse than Bush, New Drinks to Get You By, Lovable Dog Breeds to Adopt and Reasons to Love Global Warming and other assorted non-related topics. By now you will have already seen that this book is not focused, no matter what its title. It is difficult to give any of the chapters much credence, other than the one with nine people worse than GWB. There is a brief thumbnail sketch after each one, and the nine nominations include Tomas de Torquemada from the Spanish Inquisitions, Vlad the Impaler who gave rise to the Dracula legend, Adolf Hitler, who needs no introduction; Cambodia’s Pol Pot and Idi Amin. Interspersed throughout the book are George W Bush jokes and then those are followed by Bush quotations, showing that Dubbya is a keen follower of Mrs. Malaprop and the Rev. Spooner, with such gems as “Security is the essential roadblock to achieving the road map to peace.” (Washington DC July 25 2003) or “Families is where our nation finds hope, where wings take dream.” (LaCrosse, Wisconsin, October 18, 2000). Quite frankly, I believe this book is rubbish. It has been thrown together hoping to win buyers on the rebound from the elections in the US. However, since slightly more than 50 percent of Americans gave George Dubbya another four years in office, perhaps the slightly less than 50 percent who lost are politically challenged enough to buy this book as well. The review copy did not come with its price in this country. I was so underwhelmed by the slim volume that I could not be bothered to find out how much it sells for. Even given away free, it is not worth keeping. It is also too light to hold the door open in anything past Force 1 on the Zephyr scale of breezes. Perforate the pages and hang in the toilet. Taking these sorts of comments to heart, Stephen Leather has published it himself, so now you can go to your favorite bookseller, and for B. 350, buy the best book regarding the relationships with bar girls that you can ever read. This should be compulsory reading for all first-timers to Thailand. Buy one for your friends back home. Luther Grosvenor finally made it back into the studio to record his first album in nearly twenty years, in 1996 at Steve Winwood’s studio. Once there the creativity stacked up over the years all came tumbling out. In two weeks ten tracks were completed and ready for release. Luther surrounded himself with old mates including ex Spooky Tooth Mike Kellie (who as well as playing sturdy drums wrote ‘Fullness Of Time’ for the album); Dave Moore took the keyboard position; while Steve Dolan has the time of his life supplying the bass notes. Jess Roden makes two guest appearances on the two cover songs, a storming version of Joe Tex’ ‘I Wanna Be Free’, and a roaring slab of Bob Seger’s ‘Fire Down Below’. But it is obvious Luther Grosvenor is the star. Ariel Bender leaps out at you during the rockers and nails the solos to the mast. The solo on ‘Best Years Of My Life comes out and knocks your boots off. If there was any doubt that Luther Grosvenor had lost his chops, that doubt is gone in seconds. Just listen to the opening song, the autobiographical ‘Evesham Boy’. 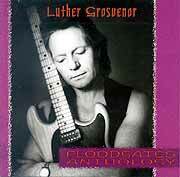 Luther Grosvenor co-wrote six of the songs with long time buddy from Blues 92 days John Ledsom. Mixed into the album are some wonderful blues numbers where Luther really lets rip, along with a very moving instrumental ‘Cathy’, dedicated to Luther’s wife. The music was arranged by Dave Moore, but Luther’s playing is outstanding, you really have to love some very much to get that sort of emotion out of a guitar. The title song is played twice, once electrically and again at the end of the album acoustically. ‘Floodgates’ is without doubt one of the great albums of the nineties. With the great critical success of ‘Floodgates’, the idea was put out to re-form the original Spooky Tooth, feeling that there was some unfinished business there. The band convened to Germany to start recording, but Gary Wright had to send apologies as his recording commitments in America did not permit him to join the others. So the other four, Mike Harrison, Greg Ridley, Mike Kellie and Luther Grosvenor, went ahead with recording with out him. It was a mistake. It just isn’t Spooky Tooth without Gary Wright. Obviously the playing is staggeringly good, and they get to re-record an old Spooky Classic ‘That Was Only Yesterday’, and one from the days of Art, ‘Love Is Rea’. Luther Grosvenor plays some lovely guitar, but in general the album lacked that necessary spark. It was finally released titled ‘Cross Purposes’ to an indifferent public in 1999. Luther Grosvenor did allow Ariel Bender out of the cupboard one more time though. In April of 1999 Ariel Bender joined the Ian Hunter band for the encores at the first annual Mott the Hoople Convention. The band stormed into ‘Walkin’ with A Mountain’ and Ariel Bender was so busy throwing shapes that he didn’t even notice his guitar was not plugged in (a little too much Dutch courage). But Ariel Bender still performed the gig of his life. Those wonderful people at Angel Air have re-released ‘Floodgates’ as an Anthology with an in-depth biography including some rare photos. They added on the two tracks from the Peter Green tribute album ‘Rattlesnake Guitar’; the best of the tracks from the Spooky Tooth reunion album; the first single from Deep Feeling, ‘Pretty Colours’, from way back in 1966; and as a special treat tacked onto the end is a live version of ‘Here Comes the Queen’ from 1974, Ariel Bender playing with Mott the Hoople in Santa Monica. Ariel Bender always seemed to get the last word. A second solo album was planned in 2000, but in a dramatic turn around, Luther Grosvenor decided enough was enough and announced his complete retirement from the music business. This time it seems like the retirement is final. A man who can produce an album of the quality of ‘Floodgates’ will be sorely missed.